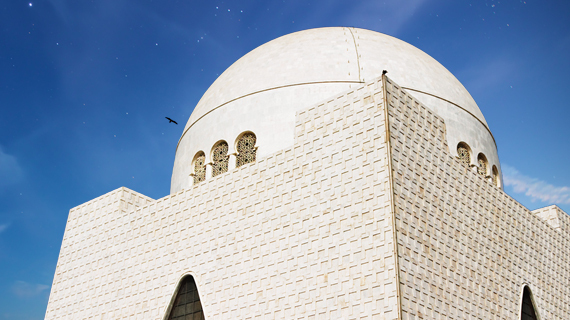 It is locally termed as the City of Lights for its liveliness and the City of The Quaid, for not only being both the birth and death place of Quaid-e-Azam Muhammad Ali Jinnah the founder of Pakistan but also his home after 1947. Residents and those born in the city are called "Karachiites". The area of Karachi was known to the ancient Greeks by many names: Krokola, the place where Alexander the Great camped to prepare a fleet for Babylonia after his campaign in the Indus Valley; 'Morontobara' (probably Manora island near Karachi harbour), from whence Alexander's admiral Nearchus set sail; and Barbarikon, a port of the Bactrian kingdom. It was later known to the Arabs as Debal from where Muhammad bin Qasim led his conquering force into South Asia in 712 AD. Karachi was founded as "Kolachi" by Sindhi and Baloch tribes from Balochistan and Makran, who established a small fishing community in the area. Descendants of the original community still live in the area on the small island of Abdullah Goth, which is located near the Karachi Port.The original name "Kolachi" survives in the name of a well-known Karachi locality named "Mai Kolachi" in Sindhi. Mirza Ghazi Beg, the Mughal administrator of Sindh, is among the first historical figures credited for the development of Coastal Sindh (consisting of regions such as the Makran Coast and the Mehran Delta), including the cities of Thatta, Bhambore and Karachi.